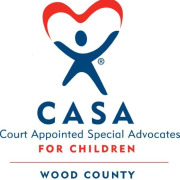 The mission of the Wood County Court Appointed Special Advocate/ Guardian ad litem Program is to recruit, train, guide, monitor and maintain qualified CASA volunteers (Court Appointed Special Advocates), who are appointed by the Wood County Juvenile Court Judge as Guardians ad Litem to advocate for the best interests of children who are before the court as a result of abuse, neglect and dependency as defined by state child welfare laws. CASA/GAL volunteers serve as an independent voice throughout the juvenile court proceedings, until a safe and permanent home is found for each child. The Wood Co CASA/GAL Program, Juvenile Court, provides staff support to volunteers who would like to make a difference in the life of a child who has been abused, neglected or dependent. The program provides training to prepare individuals for this role, monitors the work being done, provides advice, support and direction to the volunteer. On going training is provided to ensure compliance with National CASA Association mandates as well as state mandates for qualification and ensure excellent advocacy is provided to each child in need. The program began in 1988, is members of National and State CASA Associations, is in compliance withl standards of quality practice as required by these memberships. Friends of Wood County CASA (501c3)mission is to lend support to the program through promoting public awareness, fund raising and monitoring needs of the program is in need of volunteers. Members of Friends of CASA hold evening meetings bi-monthly to plan and organize awareness activities to support the work of the program and CASA/GAL Volunteers. The Citizen Review Boardsvolunteers review court files and case plans and make recommendations to the Judge and if any other services would benefict the family and child. Would you recommend Wood County CASA/GAL Program?